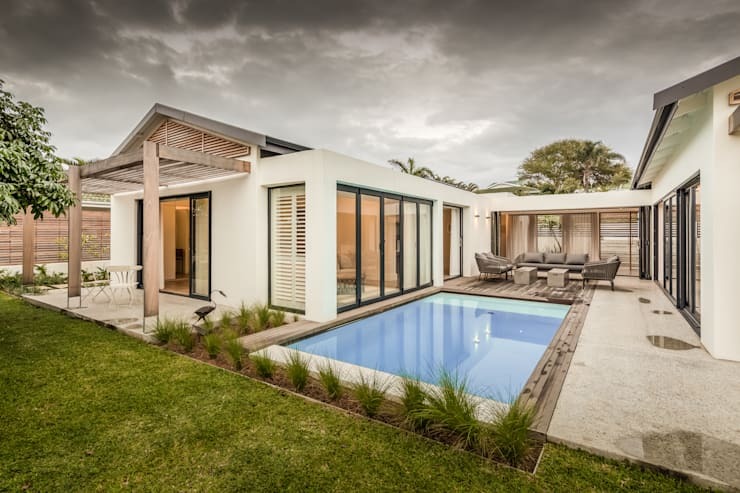 For today’s homify 360° discovery, we travel east to the Umhlanga coast where a modern house shows us how open and transitional spaces between interior and exterior can assist in making the most of a confined site. The professionals in charge here? 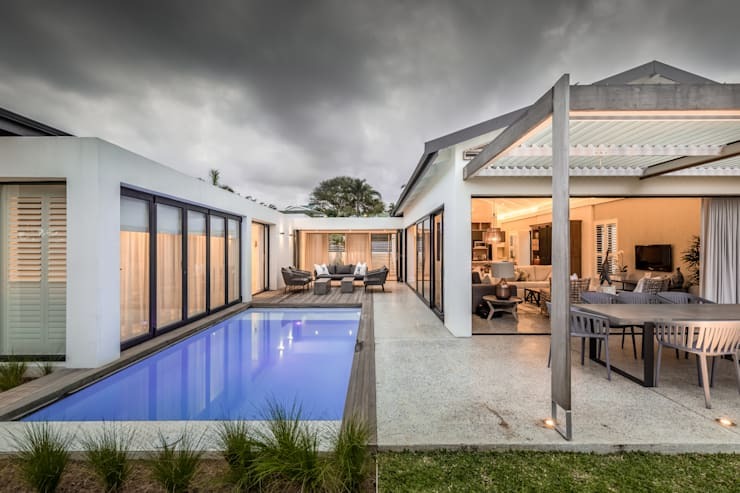 Sphere Design & Architecture, located in Durban. 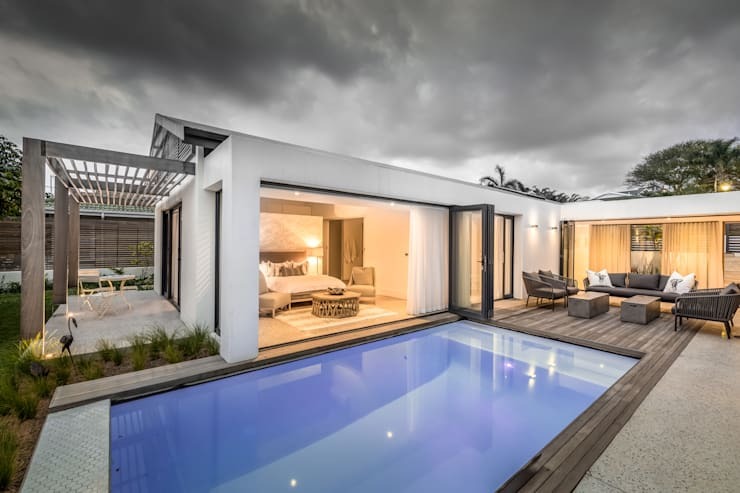 This company was established way back in 1999 and focuses on a variety of projects including office blocks, housing developments, shopping centres, hotels, industrial complexes and luxury homes. Let’s take a quick look at this seaside project of theirs. Would you agree that the rear side of the house flaunts a very charming and welcome look? With the house curving into a U shape, it beautifully hugs the pool- and exterior seating area (which is undoubtedly where the majority of the outside socialising and entertaining take place). Notice the delicate architectural touches which beautifully enhance the structure and look of the house, such as the timber pergola, pitched roofing, glazed surfaces, wooden deck, etc. Thanks to the glass windows and bi-fold doors which (very almost) reach the full height of the ceiling, we get to take a sneak peek at the indoors. On the right, we manage to get a glimpse of an open-plan area which seems to house the living room in the front and a kitchen in the back. But don’t overlook that super gorgeous dining set on the terrace out front, which definitely goes hand in hand with the swimming pool and exterior seating spot in terms of styling up this house’s al fresco ambience. From this angle, we can make out a faint glimpse of the bedroom in the other wing of the house – and the fact that it’s been decorated in soft neutrals and a warm earthy colour palette. Undoubtedly, those pale hues go a long way in allowing incoming natural light to bounce around and light up the room, yet what we are more attracted to is how those neutrals contrast with the cool blues of the pool – not to mention the lush greens of the adjoining garden. What a fascinating combination indeed! Want to see some more local talent? These 15 South African homes will take your breath away.